Micromanagers kill the drive and passion of their team. It’s a bit of a paradox, really. By working harder, managers think that they’re doing their team a service. But the more responsibility they take on in terms of daily tasks, the more they take away from everybody else. And when they take away responsibility, they rob their people of a sense of ownership. When people take care of something and treat it like their own, they develop a passion to see it succeed. In my past life as a bartender, I remember feeling that my job was to make drinks that people enjoyed. In that way, I created great guest experiences. I took pride in it. We had drink times to hit, people to serve, and over time my skills grew significantly. One thing I didn’t understand about my job as a bartender was the notion of cleaning duties. I remember telling my manager, “I am paid to make drinks quickly and accurately. My job is to improve the guest experience – to make drinks that people love, and to make them quickly so no one has to wait. Shouldn’t you hire someone else to clean?”. One day, ownership approached me about a new restaurant opening downtown. I was asked to design, lead bartender training, and manage the opening of the bar. The restaurant was projected to become the busiest bar in the city because it was situated beside a venue that would host dozens of concerts and sporting events. Thousands of drinks would be served within only a one- or two-hour window. It was imperative that this bar operated like clockwork - and I was assigned that objective. The restaurant ownership team empowered me with responsibility. And from that day forward I felt like that bar was mine. I have never cleaned more in my life… and I loved it. I kept that bar spotless – not because someone told me it was part of my job, but because they gave me responsibility and ownership. Obviously I’m not a bartender any more but when I go visit that restaurant, I take a look around to see how well it’s been kept. The bar still feels like my own, and so I want to see it succeed. For me that’s the difference between a good employee and a great employee: Passion to get the job done not because they are paid to, but because they are driven to. So how can you cultivate passion to get the most out of your workforce? It’s not by micromanaging. It’s not about looking over everyone’s shoulder 18 hours a day, 7 days a week. It sounds strange, but it’s not about taking more responsibility; it’s about giving more responsibility… to staff. It’s about empowering your team. If you want to create a driven workforce that doesn’t do their job because they’re told to, but because they take pride in it - you need to empower your team. 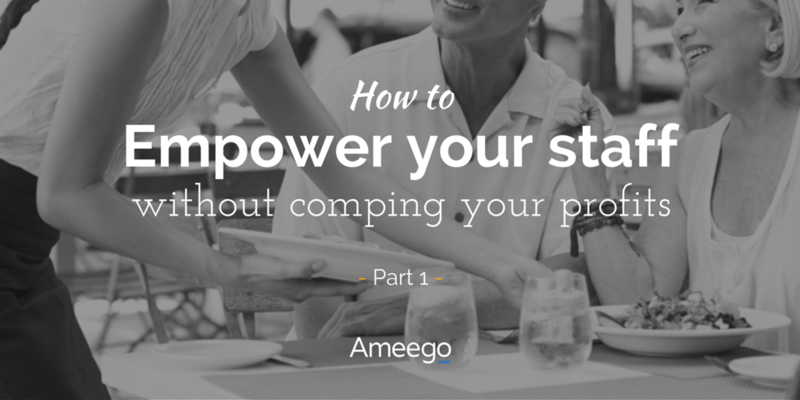 So the question becomes: How do you empower your team? If you sense that you might be a micromanager yourself, and are looking for tips on how to take your leadership game to the next level, skip right to this article about empowering your team. If you oversee one or more managers that happens to micromanage more than you feel they should, you need to approach the subject with caution. Have you ever gone through the agonizing experience of trying to influence change or create buy-in, only to be met with a list of reasons why your idea or thought makes no sense? Approaching someone about micromanagement can cause immediate confrontation which shuts the conversation down immediately. For this reason, I’ve outlined five steps below that you can use to broach the subject tactfully. I use the framework below every time I need to convey a concept that might not be welcomed with a standing ovation - which is pretty much any concept that requires change. This framework is extremely effective, and will save you a ton of time and heartache when trying to influence change in your manager. I’ve seen it before. The idea of asking a micromanager to let go, and to dole out more responsibility comes across as a slap in their face. The first thing to realize is that they are micromanaging because they care – a lot. 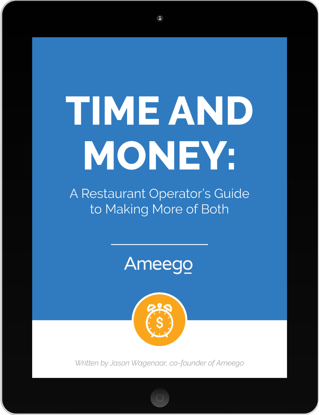 At Ameego, we have a “Weekly OT Watch” feature that orders employees by the risk of them entering into overtime and managers are always at the top of that list. Managers work more hours than everyone else. They miss birthdays and family dinners. Your job in this part of the conversation is to get the manager to say “Me too”, not “So what”. Tell the manager that you know how exhausting it is to not only figure out “what” their team’s objective should be, but also “how” to achieve it. Tell them you understand how demoralizing it is when your “well-thought-out plan” is met by staff with indifference. Tell them you understand how frustrating it is when you log so many hours in a week, and you still don’t hit your restaurant’s weekly goals. Tell them you know what it’s like to feel like you’re on an island - and that if you’re not at the restaurant, everything will fall apart. Lastly, tell them that they’ve paid their dues, and you want to share a tool with them that will change it all. This step is all about the logic. 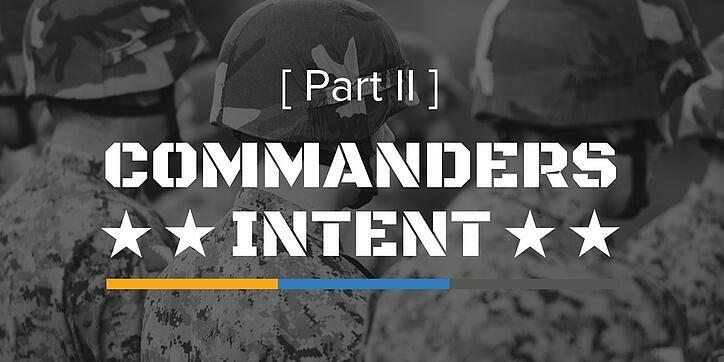 This is where you explain to your manager what the commander’s intent is, and some examples of how to use it. Remember, your goal is to influence change in your manager. Logic is only a small part of influence. 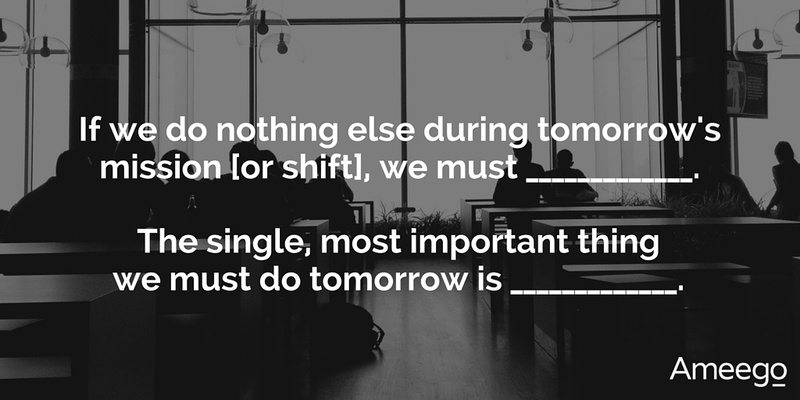 Give your manager enough logic to understand one or two ways to implement. The Commander’s Intent is a tool that liberates micromanagers from having to sort out the “how” for everyone on their team. Here is a great link that explains the Commander’s Intent, and here’s the empowering your team article that explains how to implement it. It is an essential tool in leadership. It was created for military operations. 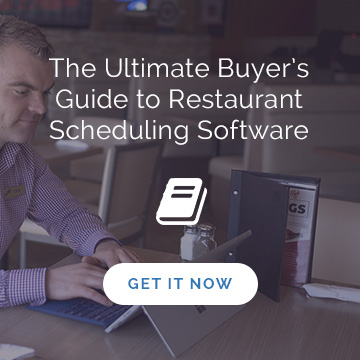 This is a great tool for both you and your manager to put into use in the restaurant. Commander’s Intent is “a clear description of the desired outcome of an operation”. It’s about telling your team what success looks like at the end of the day, without having to map out each and every step for how to get there. In your conversation with your manager, explain what the Commander’s Intent tool is. Explain how to use it, and why you think it can be incredibly beneficial for them. By communicating their end goals – their “intent” – to staff, your manager can free themselves from having to figure out and outline every single step. At the same time, they’re demonstrating trust that the staff will get the job done. The manager will be empowering their team. Or, perhaps the argument will be “I hate change”. You might say, “Yup, you’re right. I used to feel that way too, but then I realized that if you’re not changing, you’re not growing. I knew it was time for big boy (or girl) pants,” which usually gets a chuckle. The alternative is to do nothing. You’ll continue to exhaust yourself sorting out the “how” for everyone, and continue to demonstrate to your team that you don’t trust them to get the job done. Remind the manager that implementing the Commander’s Intent will free them from the tyranny of “how”. The manager will have more time with guests, more balance in their life, and more time to spend further developing their relationships with their staff members. The manager will grow as a leader, and grow the abilities of their team. The last crucial step? Ask them to call a meeting with their supervisor or management team, and let them know there’s going to be a change in the way they lead - a change that’s going to benefit everyone. And remember, don’t get too deep into “how” the manager should roll this out, otherwise you’re micromanaging! Show the manager that you trust them to get the job done. 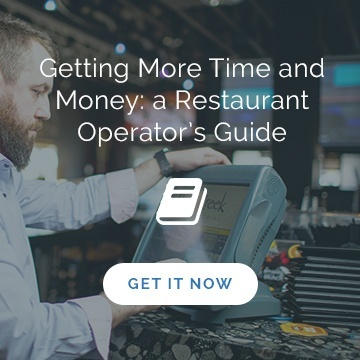 If you want to increase the sense of ownership at all levels of your restaurant team, to get the most out of your GMs and KMs, and to help them cure their micromanaging ways, then you’ve got to ask them to empower their staff. You’ll have a more passionate, happier and ultimately more productive and profitable team all around.